or: “ThereÂ´s nothing wrong with a little shooting as long as the right people get shot” (just had to squeeze that quote from the new De Niro / Pacino flick in, check Animal NYC for the full story.). Anyway: I got an email from Australia today asking me to put up the new “Get Nice” mix from Bashment Jack on this blog. And as thereÂ´s nothing wrong with a nice mixture of dancehall, disco and dolly, IÂ´m happy to do so. Get over to ZShare to download it for free and check Get Nice for the tracklist. 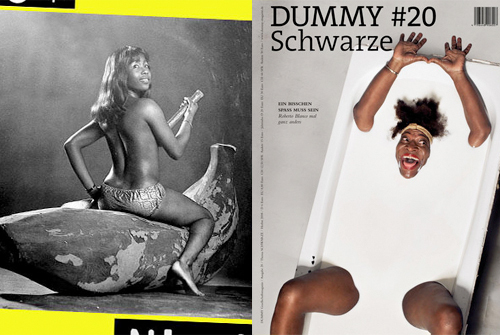 In other news, German magazine “Dummy” – a quite brilliant mono-thematic quarterly getting art directed by a different agency from issue to issue – recently released #03/08: the “Black People” issue (e. g. talking about Sarotti chocolate, black models and hip hop album sleeves). Originally, it was supposed to be called “Negroes” before a politically correct comment storm hit the magsÂ´ blog. While I of course agree that a magazine mainly put together by white people like me should very careful with using those kind of terms, I guess that 90% of the people complaining about the title, never actually had to do with black people and should therefore just shut the freak (I guess they use that kind of expressions) up. My advice for the rest: Buy Dummy. If you donÂ´t speak German, learn it – I mean, even Kanye gives props to cultural goods from my damn nation these days.